Posted on December 9, 2012 in Front Page and Musings. 4 Comments Tags: Productivity, Productivity Tools, Time Tracking. Where does the time go? With too much going on, it’s impossible to keep track of where those hours there doesn’t seem to be enough of went. A great way to get on top of your schedule is to log your hours and visualize your time. 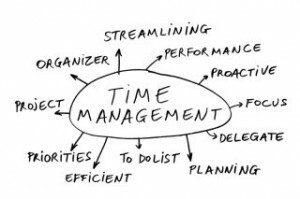 You’ll be able to see which tasks take the most time to do, which tasks take longer than they need to, which tasks may require more attention, and what your biggest time wasters are. Toggl is a great free, simple, and intuitive application that allows you to track your time on your desktop or with any mobile device. Its simplicity is key and easily its best feature, but for a free app it offers a ton for your business. The tool integrates with a ton of other tools you might use like BaseCamp, FreshBooks, QuickBooks, or ActiveCollab. You can see clear reports and graphs to see where your day went and forward those reports in Excel or PDF formats. You can also track a team’s hours and even allot hours for specific projects. The app is free for up to 5 users but larger businesses will need to upgrade to the Pro edition at $5 per user. Harvest is another popular time tracking and invoicing tool that offers a few more features than Toggl but costs more as well. Harvest allows you to track your time on a desktop or mobile device, provides extensive reports and graphs to help you visualize where your time went, manages your team’s hours and budget, sends invoices right from the app, and offers timesheet approval features. There’s also Google Apps integration, and other 3rd party add-ons. If you are a single user, you can get a free version that supports 2 projects and 4 clients but others will have to pay. A solo account for 1-3 users costs $12 per month, a basic account for 5-10 users costs $40 per month, and a business account for 10+ users costs $90 per month. RescueTime is a different kind of time tracking tool but one that is very effective and helpful. RescueTime lets you see exactly where you spend time on your phone, tablet, and computer. You simply download the app and let it run in the background. The app will record exactly what applications and websites you are using. You can check in as often as you like to see how much time you spent on work and how much time you spent on Facebook. The app is great for spotting trouble times and zones in your day and doesn’t let you get away with spending an hour playing Words With Friends. Posted on September 18, 2012 in Front Page and Musings. 2 Comments Tags: Email Overload, Organization, Productivity. 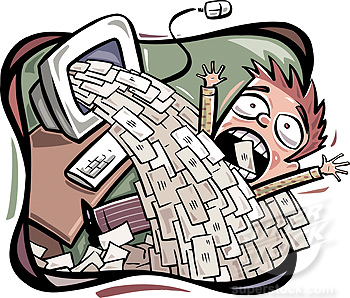 Email overload is a chronic state for many business owners and workers. From constant message alerts to non-stop back-and-forth question and answer sessions to neverending spam that gets through your filters, studies say the average person spends over a quarter of their day dealing with email. But that doesn’t mean it has to be this way. You know perfectly well there are better ways you can be spending your workday to increase business and get through your workload more efficiently. 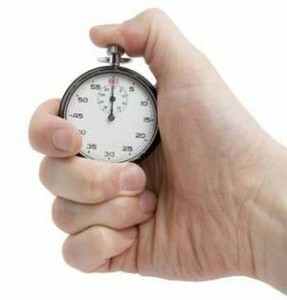 Let’s look at some ways to get that time spent handling emails down to a more reasonable amount. This one should be obvious, but many people opt for just one email account for everything or occasionally mix in personal with business. You shouldn’t have any Groupon deals or Facebook friend alerts in your business email account. Leave personal distractions for later: your business account should have only the emails you need to deal with for your work. Don’t simply separate your work and personal accounts, organize your work account as well. If you’re a small business owner, you have to wear many hats. Separate sales and client emails from co-worker and employee emails from contractor and service provider emails from bills and invoices, etc. This allows you to deal with just the emails you need to deal with right now and not have to be overwhelmed by the mass of other messages clogging up your inbox. I myself have about 10 different folders that I can check on an as-needed basis. Just because you can receive emails on your phone and read then on your desktop all day, doesn’t mean you should. Yes, a prompt response is usually expected but you have your own schedule to stay on top of and you need to stop dropping everything to reply to a message. Schedule two or three specific times in the day to deal with email, just like you schedule the rest of your tasks. Emailing can be infinite so not only do you need to schedule times to start checking emails, you need to set time limits to stop checking or writing emails once you’ve started. Schedule a small block of time and email only during those times. And be strict! Don’t fall into the “Let me just take care of one more message” trap. It can be stressful knowing that co-workers, clients, or employees are sitting around waiting for your response. Consider adding an auto-response to your email account that tells people when you check your email, when they can expect a response, and how they can get in touch with you if it’s an emergency. No matter how much we try, we over-subscribe to newsletters and updates and our email addresses end up on countless marketing lists. That cool housewares store’s newsletter seemed like a great idea at the time but deleting it every week takes actual time from your day. Handle unimportant senders immediately: Unsubscribe from their lists and nip it in the bud. A good tool for unsubscribing from many lists quickly is Unroll.me, a very simple little tool that can be quite effective at slowing the stream of junk to your inbox. When you’re emailing clients, leads, project breakdowns, or anything else that you send out often, you’ll usually use the same stock wording in your message. Just like an automatic signature, create a few email templates to avoid writing the same things over and over again. Or check out the fabulous program ActiveWords that will substitute any text for a few simple keystrokes. This gives you even more fine control and virtually eliminates retyping of common responses. This is a big part of the Inbox Zero principle that is growingly popular on the web. When dealing with emails, it’s important to make a decision and act immediately rather than keep saving emails for later. By simply acting on each email immediately, your inbox will stop overwhelming you with stuff you needed to get to days or weeks ago. Keep your inbox clean and even retask it so that you’re dealing with things you really can easily take care of. Posted on August 20, 2012 in Front Page and Musings. 0 Comments Tags: Information Overload, Productivity. Tim Ferriss’ 4-Hour-Workweek approach to productivity is one of my favorites because it’s based on radically simplifying your life. One of the ways to do this is to stop the information overload. But for professionals who largely live on the web, this can be tough. The never-ending news alerts, emails, phone calls, voicemails, and text messages can all make for a pretty overwhelming day. Within an hour of waking up, our heads are usually filled with a ton of unnecessary information from the latest industry trends to your daily Groupon deals to the latest news on Robert Pattinson’s relationship problems. If we have any hope of being at our best, it needs to stop. In The 4-Hour-Workweek, Ferriss mentions that he never watches the news, never reads the paper, and never browses CNN. Instead, once a week, he will ask a friend or even a stranger at a bar or cafe, if there was any big news that week. If there was anything important, he will definitely hear about it and save himself a ton of time. 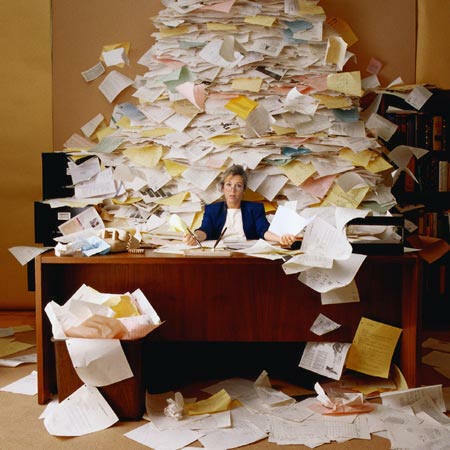 When it comes to work-related information overload, Ferriss reminds everyone to re-take control of their lives. You don’t need to respond to every email or phone call immediately: the world won’t end. Instead, you should set aside specific times when you go through your emails and voicemails – and let your boss or co-workers know that they will not get an immediate response. Use RSS Feeds: Most websites allow you to subscribe to new content via an RSS reader and Google sends you news summaries on whatever topic you wish. Get the information you want right in your reader without overwhelming yourself with news you couldn’t care less about. Create Limits: Stop using your peak times to go on Facebook, Twitter, or surf the web. Set times for yourself to take a Facebook break but avoid becoming distracted by your friend’s never-ending puppy photos. Relax on The Weekends: Taking time off from consuming information altogether can be a great way to clear your head. Try to avoid wasting your free time on the weekend consuming information and relax your brain instead. Let Everyone Know Your System: It can be difficult to disconnect from the constant stream of emails and text messages but it’s easier if you let people know what to expect. Ferriss recommends adding an email signature that lets people know that you check and reply to your email at such-and-such specific time but if they need an urgent response they should call you instead.